This recipe comes straight from Sifting Through Clues, which comes out next week. As many of you know, my protagonist Jenna and others in the series comment on the recipes at the end of each book. Here to comment on this one is Jenna. Hi. I love Indian spices, particularly the flavor of curry. Adding curry to this delicate sandwich adds just the right amount of zing. Katie taught me how to make the perfect hard-boiled egg. She heats up the water to boiling and, using tongs, sets each room-temperature egg into the water. If you don't use room-temperature, they will probably crack. Katie leaves it boiling (on medium heat) and cooks the eggs for 10 minutes. Then she removes the eggs with tongs and sets them in a bowl to cool. Voilà. Done. The shell comes off without a mess. The yolk is a perfect yellow color. And now back to me (Daryl). In the book, Crystal Cove is sponsoring the Book Club Bonanza. Book clubs from around the state are coming to town. The Mystery Mavens, the book club that Jenna and friends belong to, are having a moveable feast to discuss the mystery they're reading. As it so happens, the mystery is The Diva Serves High Tea (by our very own Krista Davis). At one of the stops, they serve tea sandwiches. Perfect, right? 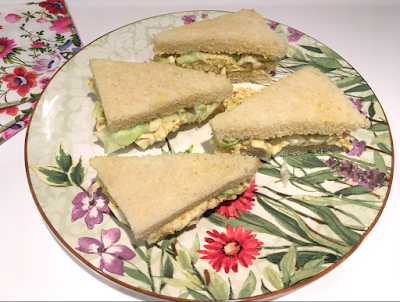 Tea sandwiches are easy to make. You can cut the crusts of the bread off before or after. It won't matter. In the story, Katie gives a demonstration how to make tea sandwiches just in case you want a step-by-step tutorial. In a medium bowl, mash the eggs, mayonnaise, and curry powder together. Season with salt and pepper to taste. Spread the egg mixture over half of the bread slices. Top with a small amount of lettuce on each sandwich, then the remaining bread slices. Cut the crusts from the bread. Cut each sandwich into four triangles.